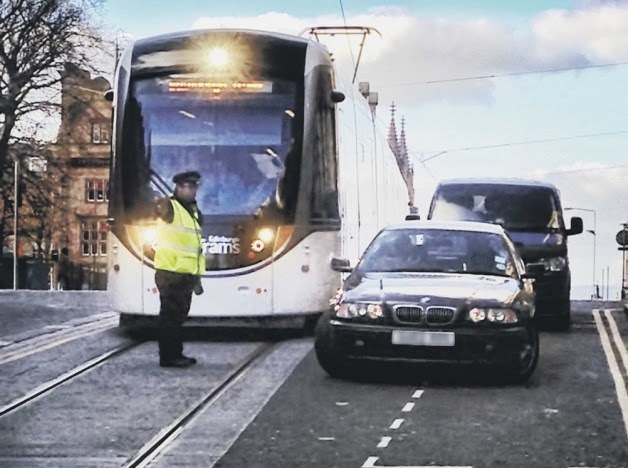 IT has taken seven years and cost £776 million to build however a piece of dodgy parking is enough to stop Edinburgh’s new tram system in its tracks. Testing of the line was interupted on Monday after a motorist abandoned a dark grey BMW 5 Series on a loading bay in South St Andrew Street. The car was left more than a yard from the kerb and sticking out onto tram track. The incident meant testing was unable to run for more than ten minutes and resulted in a £60 fine for the motorist, believed to be in his late 20s. A crowd of more than a dozen people gathered to watch as the man’s passenger returned to find two parking wardens ticketing the car. He then attempted to talk his friend out of a ticket – even as a second tram arrived from York Place to also find its way blocked. The driver eventually returned from the direction of Princes Street and jumped in the car before speeding off – just minutes before a recovery vehicle arrived to cart his car away. Council officials have warned that any driver whose car gets lifted by the tow truck will face a £180 fine for its recovery. City transport convener Lesley Hinds said: “We continue to actively enforce parking and waiting restrictions along the tram route, paying particular attention to South St Andrew Street, West Maitland Street and Haymarket Yards. Should have had a higher fine, some motorist think they can do what they wan't. Where I live we have had to divert buses off their route, because they have parked blocking the road. If they can't read signs they should not be driving or sent somewhere to re-learn what signs are there for.